We managed to go see it this morning, and the halls were crowded but not too bad. It is Golden Week, after all. Terry's been off work but it's too expensive to travel anywhere (and the British School is in session anyway) so we've stayed local, enjoying our childless days (no offense, boys). 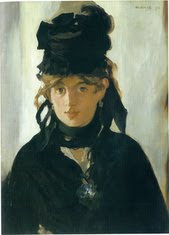 The Manet exhibit is presented in Japanese and French. Luckily I seem to remember enough from my 3 years of high school French to muddle through the titles, and thanks to some organizational clues we caught the gist of some of the larger themes. In any case it's definitely worth a visit. And the area just outside the entrance to the building is lovely, a landscaped pedestrian plaza surrounded by open air cafes and a few benches and well placed sculptures on loan, I suspect, from the Open Air Museum in Hakone. Here's a shot of the Queen Anne style museum building from -- what's the name of this street? Let me check the atlas. Hmmm, apparently it doesn't have a name, but it's two blocks over from Imperial Palace Plaza, and features many gleaming Marunouchi skyscrapers. It's part of "Itcho London" (one-mile London). I took this picture as we were walking up to the Otemachi metro station, where we jumped on the Hanzomon line bound for Shibuya. Very easy. Basically you can take any train that stops at Tokyo station to get here. See the map at the bottom of this webpage. Now, go get yourself some culchah!